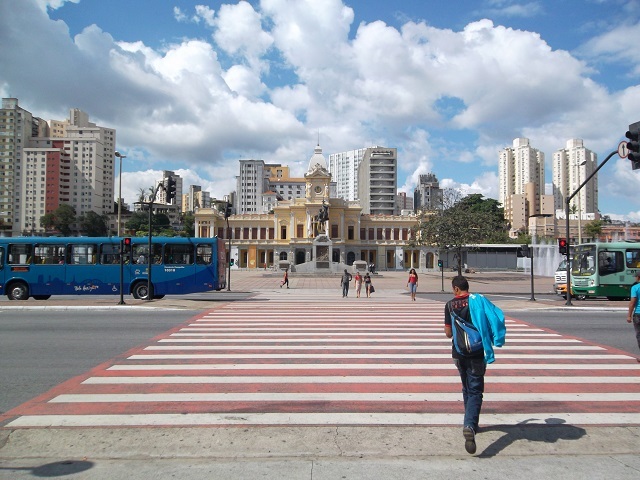 Urban infrastructure–like this pedestrian crossing in Belo Horizonte–also serves as vital public space for residents. Photo by EMBARQ Brasil. Whether static or in motion, city life essentially depends on two constants: people and space. For the past few weeks on Nossa Cidade, we’ve been talking about the role that public space plays in urban life. Today, let’s take a look in the opposite direction and analyze the public space in terms of urban infrastructure. Let’s examine the experiences of two Brazilian cities that are demonstrating that it is possible to plan infrastructure that not only meets residents’ needs, but also provides vital public space. Approximately 75 percent of the infrastructure that will be in place in 2050 has yet to be built. This can be a challenge for decision makers, as current planning must respect citizens’ rights and freedoms. Urban infrastructure has a direct impact on public space, and so is closely related to quality of life. For example, if urban development is skewed towards car-centric roads with little space for sidewalks, then it is unlikely that residents will move through their city on foot or by bike. On the other hand, if there are continuous sidewalks and bike paths, pedestrian crossings, and accessible and comfortable squares and parks, residents will be encouraged to use public spaces more actively. The case of Belo Horizonte illustrates this point. 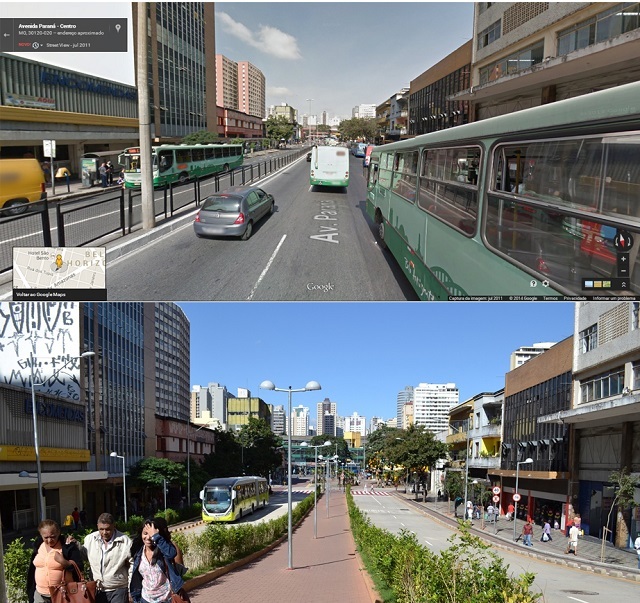 A bus rapid transit (BRT) system transformed an entire avenue in the heart of the city that was once filled with cars into a space for sustainable transport. MOVE BRT was implemented to alleviate congestion and expedite travel for 500,000 users, who have since then experienced a 40 percent reduction in travel time. Not only has the BRT system improved residents’ mobility, it has also helped revitalize the downtown area around the capital. 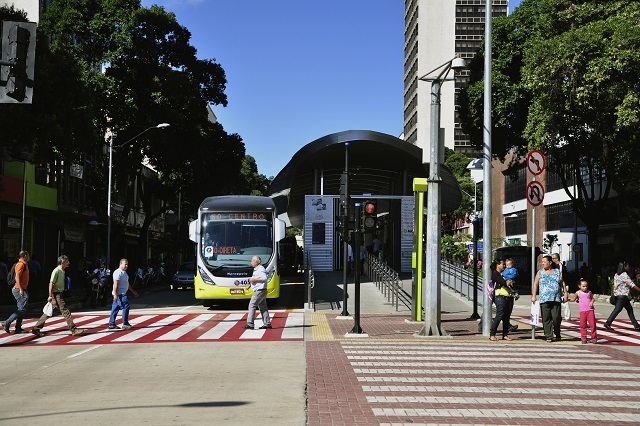 The Paraná Avenue is complete with median lanes exclusively for BRT, bike paths, and secure connections between sidewalks—bringing a variety of people together in public space. Avenida Paraná in Belo Horizonte. Top Photo: Google Maps. Bottom Photo: Luisa Zottis / WRI Brasil | EMBARQ Brasil. Avenida Paraná in Belo Horizonte. Photo by Mariana Gil / WRI Brasil | EMBARQ Brasil. 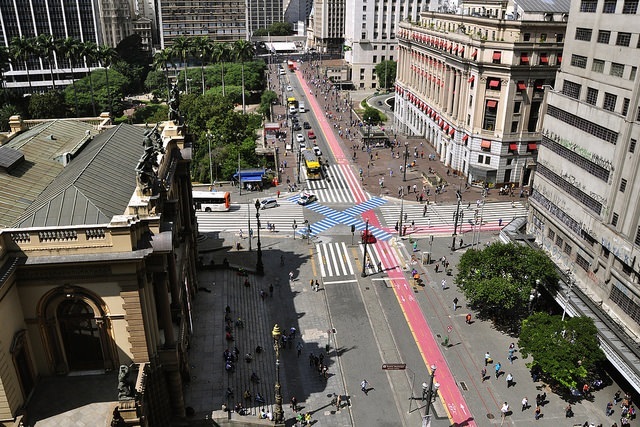 São Paulo is another city that offers several examples of people-centered urban infrastructure. For instance, last year the city officially approved a policy to incentivize parklet installations. By opening up spaces previously dedicated to parking, parklets facilitate stronger communities and social interaction. They can also serve as convenient places of escape and rest for people during work hours. Parklets can be equipped with benches, planters, tables, chairs, umbrellas, exercise machines, bike racks or other amenities. When done right, they can represent the essence of the role that quality public space plays in urban life. 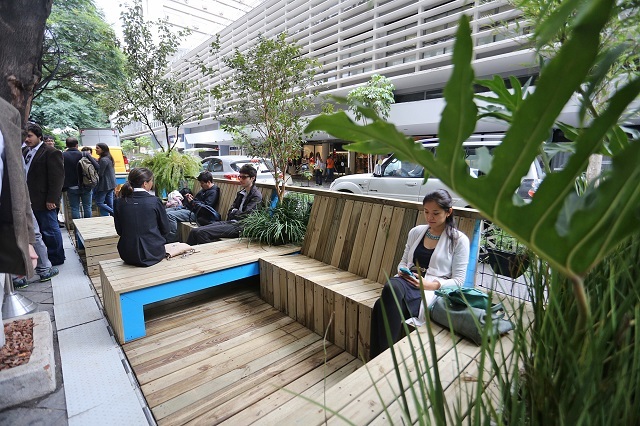 Parklet in São Paulo, Brazil. Photo by Fabio Arantes / Government of São Paulo. 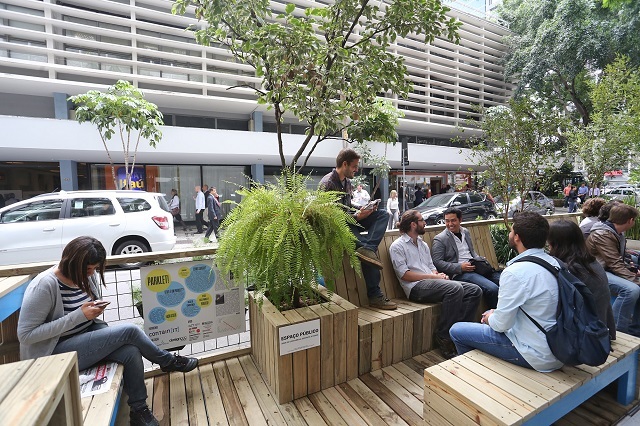 Parklet in São Paulo. Photo by Fabio Arantes / Government of São Paulo. In many cities, cycling has also become more popular on streets traditionally dominated by individual motorized vehicles. São Paulo made significant investments to its network of bike paths, resulting in twice as many users in just one year. This change to the urban infrastructure illuminated exactly how much public space was lacking in a city of 11.8 million people that regularly breaks traffic congestion records and faces poor air quality. However, it’s important to remember that bike paths should be accompanied by additional infrastructure such as bike racks, clearly marked street signs, low speeds limits, and other elements of safe street design. 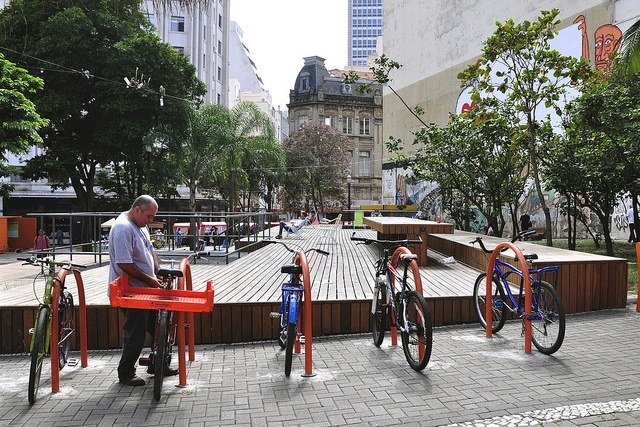 São Paulo is investing in bike infrastructure to improve public spaces. Photo by Mariana Gil WRI Brasil | EMBARQ Brasil. São Paulo. Photo by Mariana Gil / WRI Brasil | EMBARQ Brasil. Urban infrastructure is necessary for efficient, well-functioning cities. Good planning and design can result in urban infrastructure that also serves as public space, creating more human-centered cities. Belo Horizonte and Sao Paulo both show that it’s worth investing in infrastructure that expands sustainable mobility and improves quality of life. Because each city faces its own unique circumstances, not all solutions will work everywhere, especially given the common challenges of urban governance. However, it’s important that leaders address the needs of city residents in a targeted and strategic way—even if incrementally—and consider how infrastructure impacts public space. If decision makers want to prioritize quality of life, their projects must reflect that commitment.